Iggy likes to nap on the sill above the radiator in the winter. The definition of a sill is a horizontal piece of a frame, generally made out of wood, for a window or door. 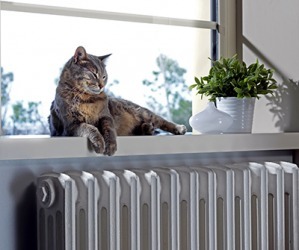 An example of a sill is where a cat may sit looking out the window. "sill." YourDictionary, n.d. Web. 20 April 2019. <https://www.yourdictionary.com/SILL>. a heavy, horizontal timber or line of masonry supporting a house wall, etc. Geology A sheet of igneous rock formed by the intrusion of magma between existing strata. A sheet of igneous rock intruded between layers of older rock. A horizontal, structural member of a building near ground level on a foundation or pilings or lying on the ground in earth-fast construction and bearing the upright portion of a frame. Also spelled cill. Also called a ground plate, groundsill, sole, sole-plate, mudsill. An interrupted sill fits between posts instead of being below and supporting the posts in timber framing. (geology) A horizontal layer of igneous rock between older rock beds. Usually spelled cill when used in the context of canal or river engineering. From Middle English sille, selle, sÃ¼lle, from Old English syll, syl (“sill, threshold, foundation, base, basis"), from Proto-Germanic *sulÄ« (“bar, sill"), from Proto-Indo-European *sel-, *swel- (“beam, board, frame, threshold"). Cognate with Scots sil, sill (“balk, beam, floor, sill"), Dutch zul (“sill"), Low German Sull, SÃ¼lle (“threshold, ramp, sill"), Danish syld (“base of a framework building"), Swedish syll (“joist, cross-tie"), Norwegian syll, Icelandic syll, sylla (“sill"). Related also to German Schwelle (> Danish svelle), Old Norse svill, Latin silva (“wood, forest"). He sat his glass on the window sill and stretched out his legs. Placing the coffee cup on the window sill, he ran a hand through thick black hair that curled in all the right places. In answer, Carmen set her glass on the sill and stood. At sill and 125 ft.